Hi I’m Gill Raddings founder of Stunt Dogs. 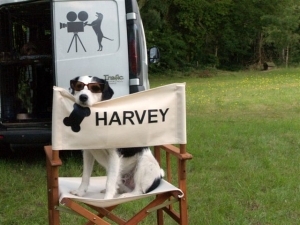 We are specialist suppliers to the film, TV and advertising industry of trained animals. We have been established for 25 years and can supply a complete service from pre-production planning and advice, risk assessment, sourcing animals where needed and training to specialist script requirements. All our dogs are trained and handled by ourselves and are rehearsed for each shoot by the Stuntdogs team of professional trainers. We are all qualified animal trainers who also compete successfully in recognised Kennel Club Agility, Working Trials and Obedience competitions. Although dogs are our specialist field, over the years we have been asked to train and supply most other domestic animals including cats, chickens, cows, pigs, goats, rats etc. Therefore we can offer farm and domestic animals all trained to the highest level. Full insurance cover is provided. Please take a look at our page of credits, and I think you’ll agree we have the breadth of experience and animals for most filming requirements, but if there is anything else you’d like to know, or if there are further images or information on any of our animals you’d like please get in touch with me. for film or TV or advertising? The presiding genius of Catwalk Dogs was unquestionably Gill Raddings. Many thanks for everything for this week regarding all the animals, they were all a success, especially the sheep!!! Roly was fabulous and I cannot thank you enough for being so professional and exceptional at your job, especially in such extreme conditions and with so little time to shoot. You and lovely Roly gave me the perfect performance and we have a very happy client. It was an absolute delight to work with you and we will do so again. We received a really lovely email today saying that the client really liked working with you and would like to work with you again on future shoots! As always a big thank you – just brilliant…no-one had seen such a well-trained dog especially when playing dead!!! Thanks so much for your sterling work on our shoot on Wednesday and Thursday. You and your team were exemplary, and it goes without saying that the dogs, especially Trip, were absolute heroes. Thank you for doing such a great job on Dulux despite the crazy quick turnaround of the job. You did amazingly and got us results we dare not hope for in advance with no training time involved. Thank you for your hard work, long hours and for being so collaborative and supportive. Greg tells me that everything went really well today and he loves your dogs! I knew it would be fine, but thanks very much for having brilliant animals and for training them so well. Just wanted to drop you a quick note to say a big thank you for today. The dogs were amazing, as always! There aren’t words to thanks you Dodger and Tori for your incredible skill, work ethic and commitment last week. You’re all amazing. I just wanted to say a huge thank you for coming to London yesterday and taking part in our video. It was a brilliant day and all the dogs performed amazingly, allowing us to get some excellent footage. I just wanted to write to say a very big thank you for all your amazingness on Cesar over the past 3 weeks. I have so appreciated everything. I just wanted to say a huge thanks to you and of course to Becky and Meg for your fantastic work on our Guinness shoot. The dogs are amazing and we were all blown away with their skill and talent (and I’m sure hours of dedicated training from Chris) and could not have done the job without them. Thanks again for last week, it was lovely working with you and your wonderful dogs. They did so so well! Thanks so much for a great day last week. It went so well for us, and we really enjoyed it too – so pleased with how much great material we captured. Isn’t Barley a dream, he made a big impression on everyone! You’ve done a brilliant job Gill, really fantastic, the animals have been amazing. And it’s been such fun having you on the team, everyone has really enjoyed it. And you’ve come in on budget, what more could we ask. Thank you. We just wanted to say a huge thank you to your team, especially to yourself. We could not believe how incredibly well trained your dogs were. Thank you so much for all your hard work during our event, we would all work with Stunt Dogs again in a heartbeat. Thanks so much for giving us Beau, Ripley and Cartier for our Diesel shoot last week. We loved working with them. Sykes was as ever the consummate professional, while at the same time entertaining us all! I’ve never known a dog like Dodger. He was so obedient and well-behaved. We all fell for him big time. “In between takes his amazing trainer Sonia Turner would get him to do tricks and he could do so many. It was a brilliant day and all the dogs performed amazingly, allowing us to get some excellent footage. Thanks so much for all your help, Teaka is a wonderful dog and everyone loved her. Thank you so much for organising for last night. Sykes was brilliant and his handlers were great.